A super-relaxed Annie Seel shares her thoughts and feelings the day before it all really gets going. 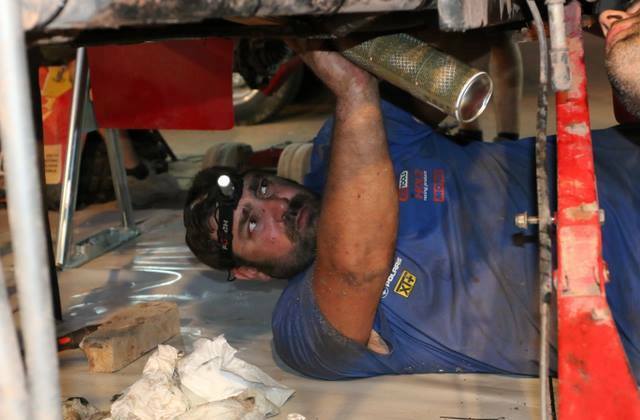 Annies focus is now clearly on Dakar 2016. Tomorrow is the 3rd of January: the prolog in Buenos Aires, then laison to Rosario. A year of planning and preparation is finally over. Today Annie and her co-driver Bert Heskes (NL) will take their Dessert Warrior through scrutineering. 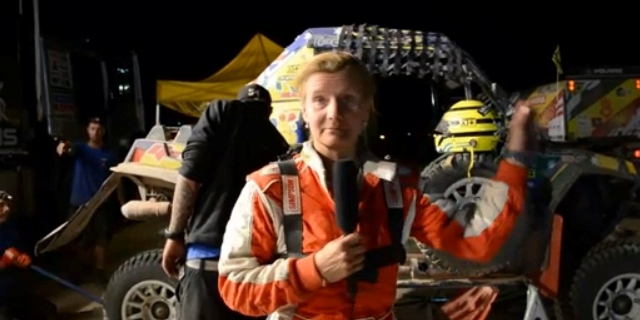 Annie’s passion for the”hardest rally-raid in the world” is tangible. The goose bumps that she shows me on her arms as she tells me that “Today, things finally get serious” are infectious, maybe signaling an end to Annies laid-back run-up to the over 9000 km trial of (wo)man and machine. 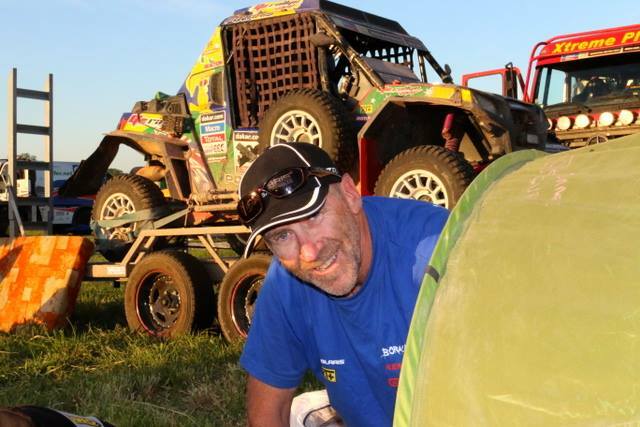 We talk of Annie’s primary goal of completing the Dakar for the first time on 4 wheels (after 5 finishes on 2) and of how the tinyest problem can lead to a retirement when unfortunate circumstances and coincidence are combined. Being the fastest female is also on Annie’s to-do list! Annie is known for keeping her head under pressure, and she is quietly confident of her, as yet unproven, co-driver Bert Heskes. Bert says that they have a natural understanding of each other, making communication simple. Bert comes with a depth of mechanical experience, having raced his own Dessert Warrior for several years. The Desert Warriors gleaming paint is as yet unscarred. 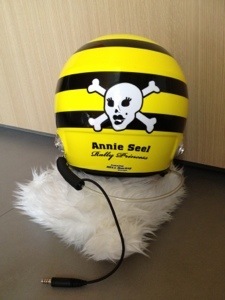 The bonnet displaying the names of many of Annies micro-sponsors. Again this year Annie is being supported by many of her fans, some who have bought a kilometer of Annie race, and others have contributed to see their names on the bright yellow bodywork. This entry was posted in Dakar and tagged #373, Annie, bert heskes. 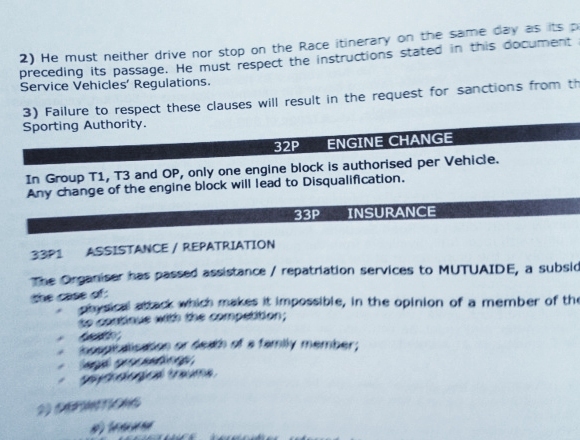 Ingen annan svensk har gjort det tidigare: kört Dakarrallyt i både bil och motorcykelklassen. I januari blir Annie Seel historisk. 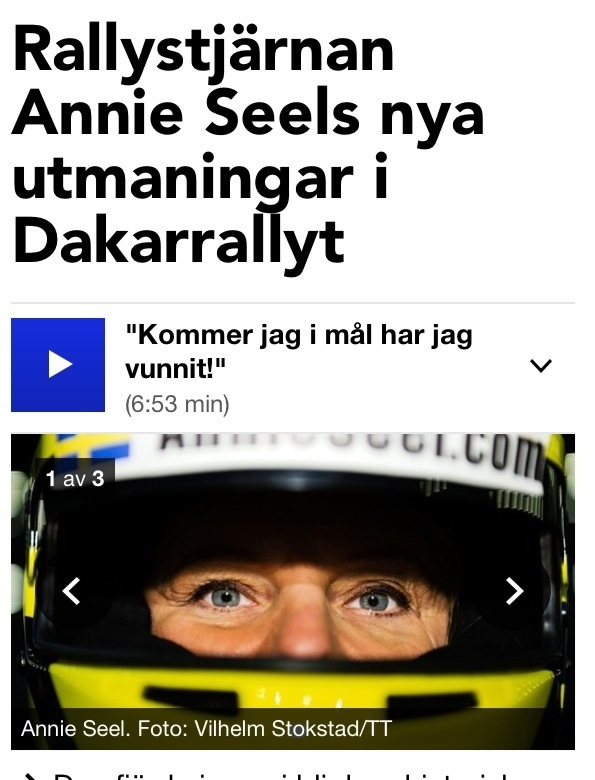 –Känns kul att ta ledarflaggan när jag hållit på med motorsport så länge, säger Seel till SVT Sport. This entry was posted in Dakar and tagged Annie, Dakar, rally, Seel. 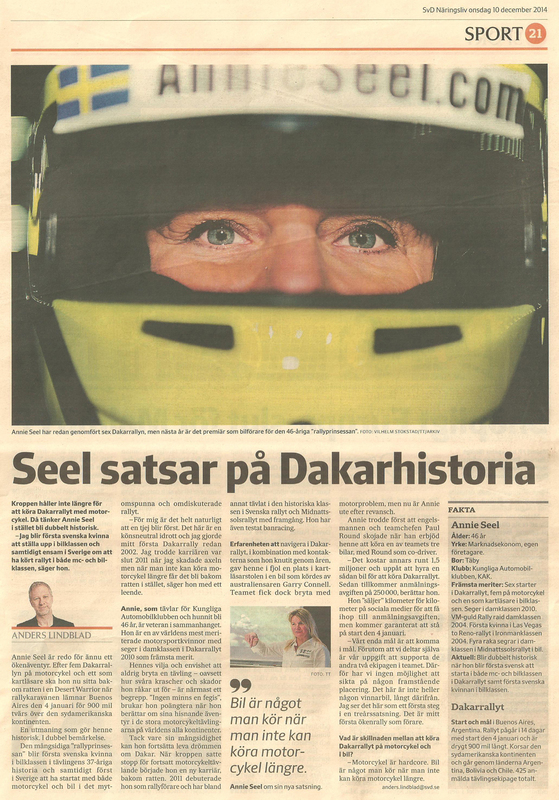 Idag höll jag presskonferens inför min historiska start i Dakarrallyt 4 jan 2015. 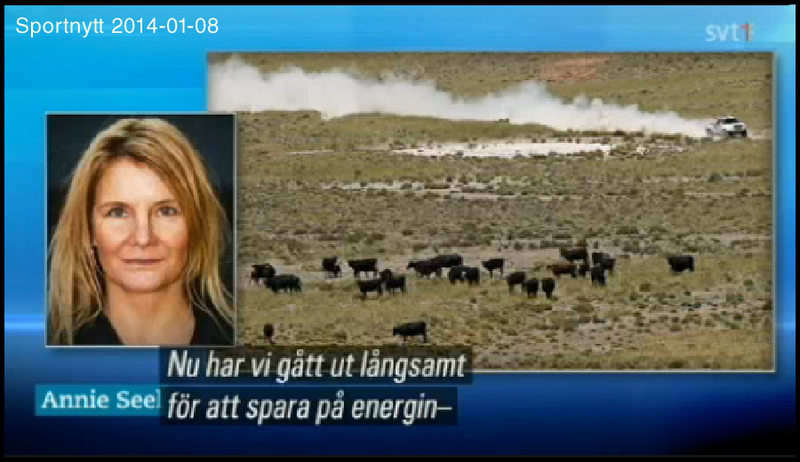 Intresset var stort och alla “stora” media har gjort intervjuer. 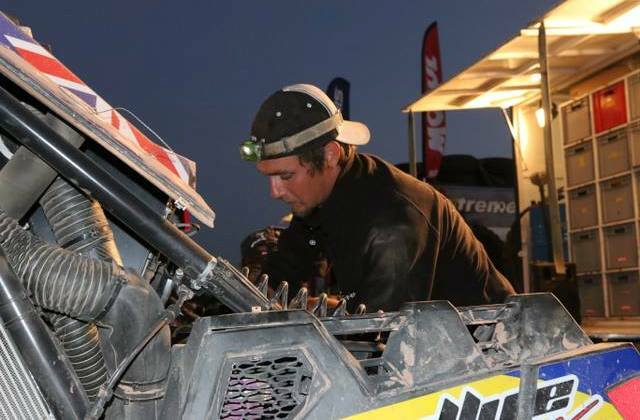 This entry was posted in Dakar and tagged Annie, Dakar, Dakar2015, princess, rally, Seel. 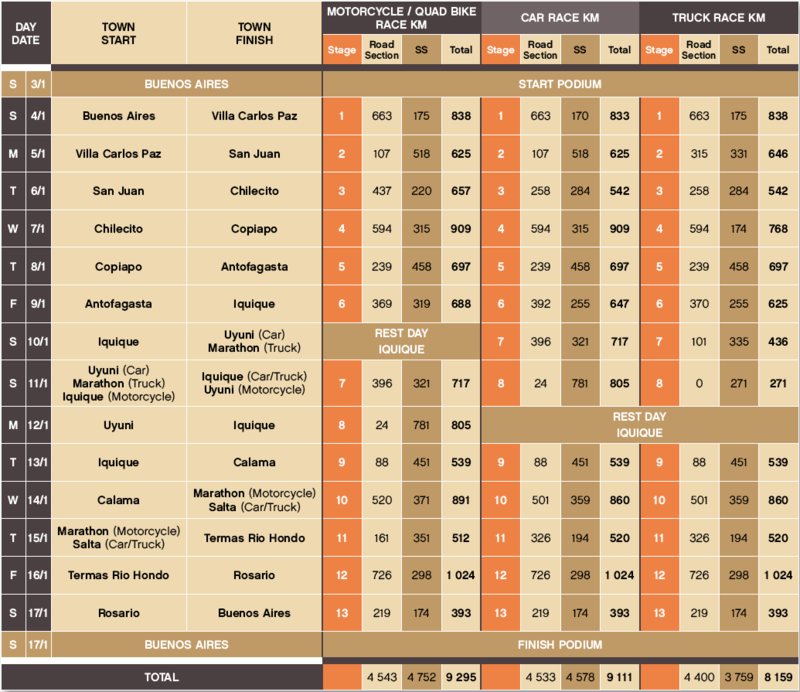 All stages of the Dakar 2015 are now official. I’m very content with my Simpson neck protection, just great! Stabilizing when reading the roadbook, I get no neck ache. I put it on before race start and won’t take it off until finished the stage, regardless what I must do in between. Garry has as an ordinary type of neck guard; no good, he says – it fits badly, difficult to to take on and off when working with the car. I have two Sabelt overalls from LM Motorsport. After the feshy stage that smeared everything it was nice to have a clean overall, while the service team washes the dirty. * The photo: last day sunbathing, then I’m two weeks fully covered by the overall during rally. The Bell helmet from G Partners is awsome, keeps all dust out. I’m very greatful to all my sponsors. 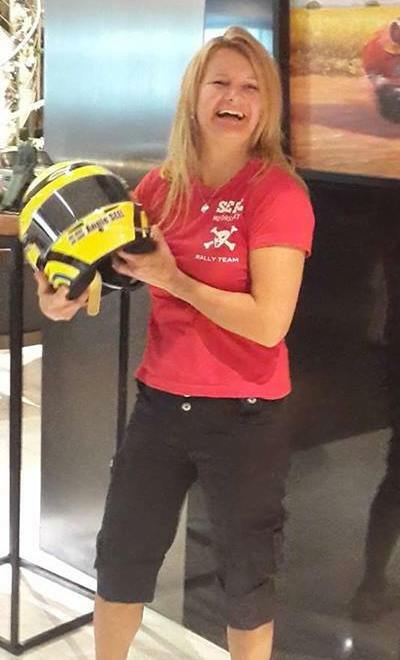 This entry was posted in Dakar and tagged Annie, Dakar, equipment, helmet.